?Your browser does not support iframes. The Yankees rallied in the eighth inning to beat the Orioles tonight. Miguel Andujar had three hits and made a nice defensive play going to his right. Brett Gardner, Aaron Judge, and Kyle Higashioka all hit home runs. Giancarlo Stanton, Luke Voit, Gary Sanchez, Greg Bird, and Troy Tulowitzki all had base hits as well. Trey Amburgey’s bases loaded walk and Clint Frazier’s sacrifice fly contributed to the three-run eighth inning rally. More roster cuts: Chance Adams, Trey Amburgey, Cale Coshow, Kellin Deglan, Thairo Estrada, Danny Farquhar, Mike Ford, and Joe Harvey have all been sent to minor league camp, the Yankees announced. I count 50 players in big league camp now. If you’re interested and will be up early, tonight’s game will be replayed on MLB Network at 6am ET tomorrow. The Yankees have another night game tomorrow night. That’s a home game against the Phillies. Masahiro Tanaka is starting and the game will not be televised. In the surest sign Spring Training is fast approaching, the Yankees announced their list of non-roster invitees earlier today. The farm system has thinned out — most of the prospect star power is in the lower minors — and, as a result, the non-roster list is largely devoid of big name youngsters. Lot of journeyman and minor league depth guys. So it goes. The Farquhar, Hale, Lavarnway, Saez, and Urshela minor league contracts are now official. The Brothers, Coulombe, Hutchison, Burns, and Lipka deals had been previously announced. Also, Lail and Deglan are back on minor league contracts. Both became minor league free agents after last season and have rejoined the team. Florial and King are the two headliners among the non-roster invitees. Florial is the top prospect in the organization (at least in my opinion) and King was last year’s breakout pitcher, climbing three levels to reach Triple-A and put himself on the cusp of a big league call-up. I don’t think King has much of a chance to make the Opening Day roster but he could put himself in position to be the first starter called up when a need arises. Last week I predicted 22 non-roster invitees. I didn’t have Deglan, Hale, or Saez on my list because they were not in the organization at the time, and I had Coshow and Ford on the outside looking in. Righties Nick Nelson and Clarke Schmidt are the two notable prospects who I thought would get a non-roster invite but didn’t. Schmidt is understandable because he’s just back from Tommy John surgery. Nelson? Dunno. Guess the Yankees don’t think the big stuff/poor command righty is ready for big league camp. The Yankees currently have two bullpen spots and one bench spot up for grabs. I think Tommy Kahnle and Luis Cessa are the front-runners for the two bullpen spots. Not sure about the bench spot. Could be Greg Bird, Clint Frazier, Tyler Wade, one of the non-roster guys, or a player yet to be acquired. 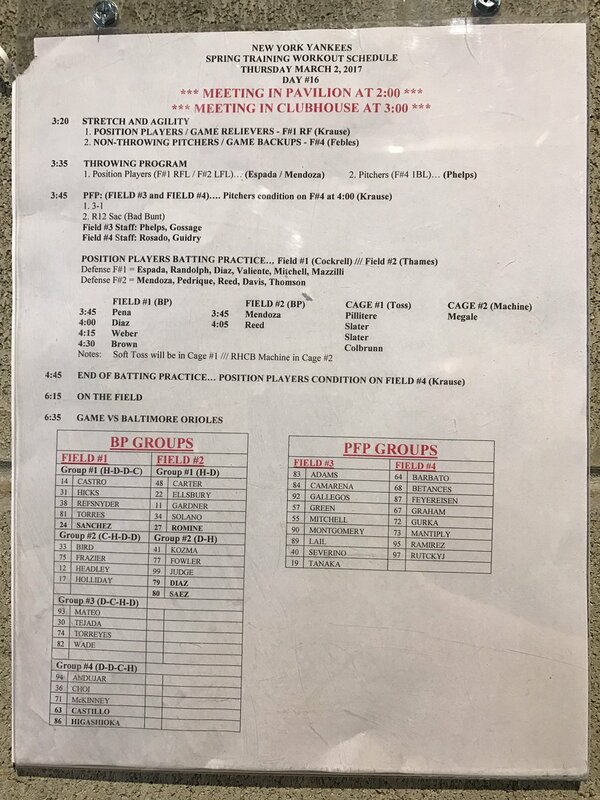 In case you missed it last night, here are the preliminary Opening Day lineups for the full season affiliates. High-A Tampa announced their roster this morning, so the post has been updated. According to Matt Eddy, the Yankees have re-signed C Kellin Deglan, loaned RHP Dallas Martinez to a Mexican League team, and released LHP Woody Bryson, RHP Simon De La Rosa, LHP Tyler Honahan, RHP Jonathan Padilla, RHP David Palladino, RHP Josh Roeder, RHP Mark Seyler, and RHP Daris Vargas. De La Rosa was a sleeper once upon a time. Alas. Two stray links: Keith Law (subs. req’d) lists Double-A Trenton as one of the most stacked teams in the minors this year, and Mike Rosenbaum has a piece on the club’s lower level pitching prospects, with info from minor league pitching coordinator Danny Borrell. Triple-A Scranton/Wilkes-Barres RailRiders begin their regular season tomorrow. RHP Chance Adams will be on the mound. The offseason has been slow-moving so far, so here are some bits of news and notes to help you pass the time. Hopefully something exciting happens soon. Otani recently hired Nez Balelo of CAA, an MLBPA certified agent, which could help settle the posting squabble between MLB, MLBPA, and NPB. The union knows Otani is in good hands now — Balelo is a veteran agent who has experience representing Japanese players (Nori Aoki, Junichi Tazawa) as well as big name players (Ryan Braun, Adam Jones) — and can be sure he is completely aware of the situation. Once the posting stuff if sorted out, Otani will be posted. Hopefully it happens sooner rather than later. Earlier this week a whopping 572 players became minor league free agents across baseball, according to Matt Eddy. Sixteen of those 572 players are Yankees. Or were Yankees, anyway. Here are the 16. Bichette and Culver are the most notable names here as former high draft picks, and Williams was once among the organization’s very best prospects. Brewer and Camarena are the best prospects right now, though neither comes particularly close to cracking the organization’s top 30 prospects list. Or even the top 40 list. Solano and Williams are the only two of those 16 players who played in the big leagues with the Yankees. Also, according to Eddy, the Yankees have re-signed LHP Chaz Hebert, who was due to become a minor league free agent this winter. The 25-year-old southpaw had a breakout 2015 season, throwing 134 innings with a 2.55 ERA (3.11 FIP) at three levels. Then he blew out his elbow and missed the entire 2016 season and the first half of 2017 with Tommy John surgery. Hebert got back on the mound late this year and will back in the fold next year. A few days ago Dan Szymborski used his ZiPS system to put together way-too-early 2018 projected standings. ZiPS right now pegs the Yankees for 92 wins and first place in the AL East next year. In fact, those 92 wins are the most among all AL teams — the 90-win Astros are second — and second most in MLB overall behind the 96-win Dodgers. New York of course had a gigantic payroll in 2017 as it typically does, but what people haven’t completely noticed about this team is that it got far more of its wins from inexpensive, young talent than the good Yankees teams typically do. The last time the team won a World Series, it got 9.7 WAR (17 percent) from players making less than a million bucks. In 2017, that number was 25.9 WAR (49 percent). Of course, there is still an entire offseason to go, so every team’s roster can and will change before Opening Day. As things stand right now though, the Yankees are set up well going into next year thanks to their young core and some nice veteran complementary players. It’s entirely possible they could go into next season even bigger favorites to win the AL East depending how the offseason plays out. Your browser does not support iframes. The Grapefruit League juggernaut marches on. The Yankees beat the Phillies this afternoon thanks to home runs by Chase Headley (three-run) and Aaron Judge (solo). Judge hit three Yankee Stadium homers in the game, but only one actually left the yard. The other two were caught on the right field warning track. Keep working on that opposite field stroke, Aaron. The Yankees will be at home against the Tigers tomorrow afternoon. That game will be on YES. Masahiro Tanaka lines up to start. Here is tonight’s open thread. I’m posting this a little earlier than usual because Team USA is playing their first World Baseball Classic game tonight. They’ll face Colombia at Marlins Park at 6pm ET on MLB Network. Pretty good pitching matchup too: Chris Archer vs. possible future Yankee Jose Quintana. Donovan Solano and Tito Polo are in the lineup for Colombia. MLB Network will have another WBC game on later tonight as well (Venezuela vs. Puerto Rico at 9pm ET). It’s cute they still budget only three hours for nationally televised baseball games. Anyway, the Nets are also playing and there’s a whole bunch of college basketball on too. Talk about those games or anything else right here, as long as it’s not religion or politics. Your browser does not support iframes. Your browser does not support iframes. We play today, we win today, das it. The Yankees won again tonight, improving their Grapefruit League record to 7-1. Greg Bird and Billy McKinney hit long home runs — Bird’s left the damn stadium — while a host of others had doubles (McKinney, Jorge Mateo, Gary Sanchez, Kyle Higashioka). Matt Holliday also hit an opposite field dinger. And heck, it’s entirely possible the hardest hit ball of the night was Clint Frazier’s line out to third in the sixth. 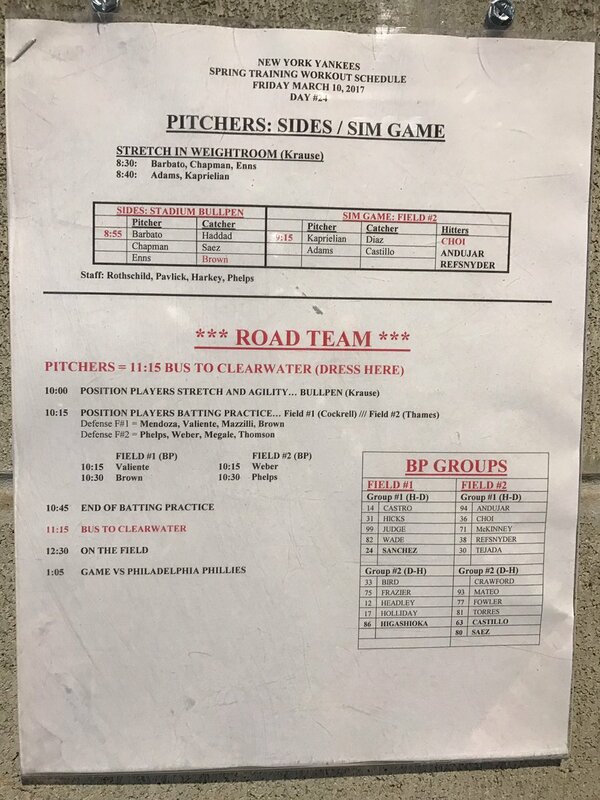 Bryan Hoch has the day’s pitching assignments and hitting/fielding groups for everyone who didn’t play in tonight’s game. Jon Niese threw a simulated game. Have to figure he’ll get into a spring game fairly soon. Luis Severino is scheduled to make his second start of the spring tomorrow afternoon. The Yankees will be on the road playing the Blue Jays. There is no YES broadcast for that game, but it will be available live on MLB Network in the New York market. And on MLB.tv too. Earlier this evening, the various World Baseball Classic rosters were announced during a live MLB Network broadcast. 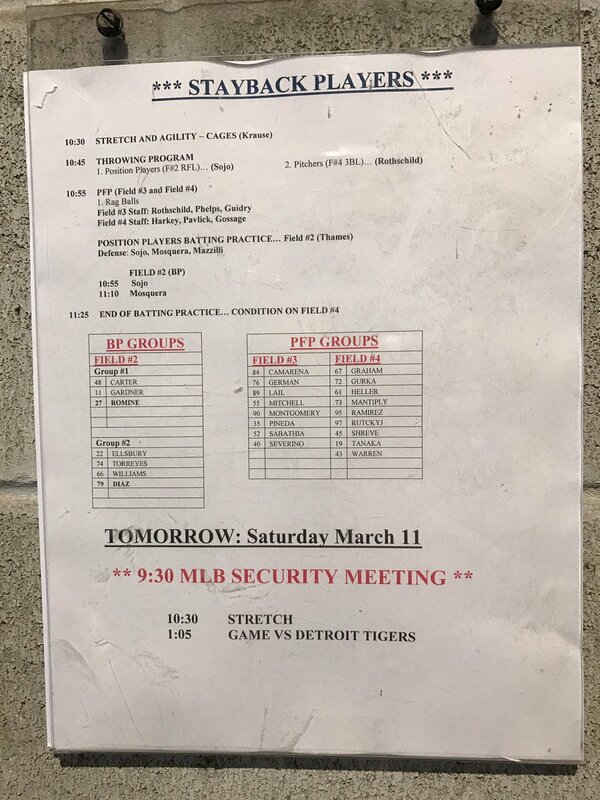 Bits and pieces of the rosters have leaked over the last several months. Now they’re all official. Michael Pineda was listed on a version of the Dominican Republic roster that leaked earlier today, but he wasn’t on the final roster. Huh. Severino is part of the Dominican Republic’s “Designated Pitcher Pool” and won’t play in the first round. Teams can add two pitchers from their DPP after each round. Bleier is on the DPP for Israel, and since they’re not expected to make it out of the first round, chances are he won’t leave Spring Training. Everyone else is on the WBC active roster. Gallegos is ostensibly competing for a big league bullpen spot, and I can’t help but wonder if being away from the Yankees will hurt his chances. I kinda had a feeling Clippard would sneak on to the Team USA roster. They were never going to get all their top relievers, and he figured to be among the second tier arms they turned to. Clippard will join former Yankees Andrew Miller and David Robertson in the Team USA bullpen. That’ll be fun. Bring them back with you, Tyler. Cuba doesn’t allow expatriates to represent the country, so no Aroldis Chapman in the WBC. 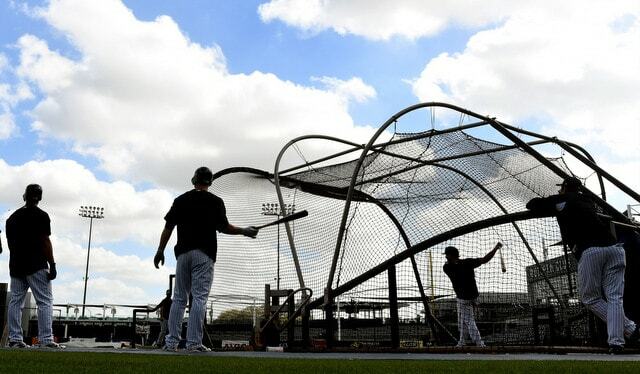 Gary Sanchez declined an invitation to play for the Dominican Republic because he wants to spend his first Spring Training as the starting catcher learning the pitch staff and whatnot. Masahiro Tanaka also declined to play for Japan. Aside from those guys, the only other players in the Yankees organization who I thought might sneak on to a WBC roster were Luis Cessa (Mexico), Evan Rutckyj (Canada), and Carlos Vidal (Colombia). Vidal was on Colombia’s roster for the qualifying round last spring, but has since being dropped. The 16-team tournament begins March 6th and will end with the Championship Game at Dodger Stadium on March 22nd. Here is the full WBC schedule.